With the ringing of GST(Goods and services tax) in India from July 1, 2017 onward, prices of daily pet supplies like pet food, pet collars, pet shampoo, pet cages and more are up for substantial changes. Although very few pet items like toys are set to become cheaper, daily necessities like imported shampoos, leash, collars, imported and indian food will see a rise in price due to higher tax rate proposed on almost every pet vertical under GST. 1)Pet food-The maximum amount required for pet maintenance is mostly spent on food, so a reduction in their price could benefit pet owners a lot. Unfortunately, pet food packets of the likes of dog food, cat food which were earlier charged at around 14.5% VAT/CST will attract 18% GST now. Not just imported brands,even indian ones like pedigree, drools, choostix will be taxed at this higher rate. While it is an increase of 4% over the previous rate, the prices of imported pet food will remain exactly same as before. Although it’s a matter of relief that most imported brands(Royal Canin, Hill’s, Farmina , Smart heart) will bear the burden of increased tax themselves, indian brands might see a hike in price(and MRP). 2)Pet Shampoo,conditioner and cleansers– Earlier pet shampoos(both imported and indigenous) were taxed at 14.5%. Now it has been increased to 28%. Hence, pet shampoos, dry sprays, and other pet cleaners(with/without spirit) are set to become costlier by at least 14%. However, don’t be disheartened because there are low-value items compared to pet food packets, so the increase will not be by a huge amount in rupees. For HSN code 33051010(shampoo), new rate finalized is 28% compared to previous 14.5%. 3)Pet Supplements– Many pet products like dog toothpaste, dog multi-vitamin pastes etc which come in paste form regardless of ingredients,will be taxed at 18% gst. So their prices will see an increase of around 4%. (18% vs 14.5%). Supplements which come as powdered form will attract at a rate of 12%(HSN code 33061020) if not treated as pet food(18%). Imported Supplements like Beaphar HD tablets are most likely to attract 18% rate(same as imported pet food), thus resulting in an increase in their price. 4)Pet Toys– Pet toys like squeaky toys,tug balls(HSN code 95030090) will attract 12% GST ensuring 3% decrease. So,there won’t be much change in price of these products if not reduction. 5)Pet cages– Pet cages including aircraft carriers are subjected to 18% tax slab for GST as opposed to earlier 14.5%. So their prices will increase by quite some rupees(around 3-4%). Since these are not daily requirements like pet food or shampoo, their effect on an average pet owner will be minimal. 6)Pet collars/leashes- All wearables like collars,raincoats,muzzles will attract 28% GST. Thus, a substantial increase in price(up to 14%) of these products is expected. 7)Pet treats– Pet treats like dog biscuits, chicken sticks, dental chews etc will be treated as pet food, so a significant increase in price(Taxed at 18%) is expected unless they are imported brands. 8)Others– Dog/cat bowls will attract a rate of 18%. HSN code for dog beds is 94049099(28%). Live pets except horse will be exempted from GST. Grooming products like steel comb,flea comb etc will be taxed at a lower rate of 12%. Unbranded food for cattle(horse,cow) will attract nil GST rate. All these rates mentioned above are true for retailers, distributors and customers in India. Update:For importers of pet products, import duty will be charged. Tax rate for importers on pet food hsn 23091000 is 30% in total(30% Basic Custom Duty,0% IGST, 0% cess). 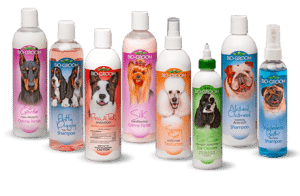 Tax on pet shampoo hsn 33051090 is 10% BCD + 28% IGST. Thus, almost all pet products except pet toys and a few grooming products will see an increase. But food and treats are the things pet owners need to buy regularly and they spend maximum on edibles. 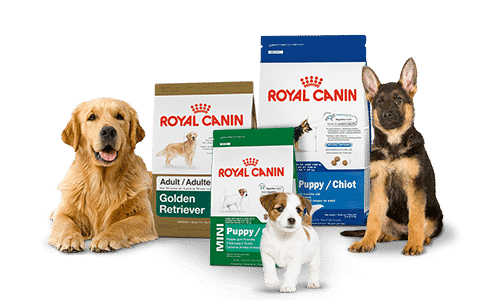 So, if you prefer imported dog food brands, you can expect an increase in monthly expense on your dog or cat which will be attributed mainly to massive rise in taxes on collars, shampoo and carriers. Then again,the over-all increase will be marginal as you don’t need to buy collars or cages every month and daily supplies which you need regularly like dry food being available at the same price as earlier. In the coming days, it will be clearer how the new GST rates affect the pet industry. Anyway, as an online pet store, we won’t have much choice other than to pass the burden of higher taxation on to customers in the coming days, only for those products whose increased rates will not be borne by the manufacturer. Also, we will try our best to keep the price reasonable and the increase at a minimum. In short, the GST tax rates on pet supplies fail to impress the pet fraternity with higher taxes on 90% items. P.S- We will keep updating this article based on how taxes are finalized by individual manufacturers. While all indian manufacturers including pedigree,choostix etc are charging 18% on pet food, Drools is still selling at nil GST from the main dealers themselves. While this might be temporary good news for the customer, retailers/distributors be advised that the sales tax department may levy a penalty at a later date because of this as the rate should be 18% . Update-As per 23rd Gst council meeting held on 10th nov 2017, tax rate on most 28% slab pet products like pet shampoo, conditioner, collars, tear stain removers etc has been lowered to 18% much to the delight of pet owners. 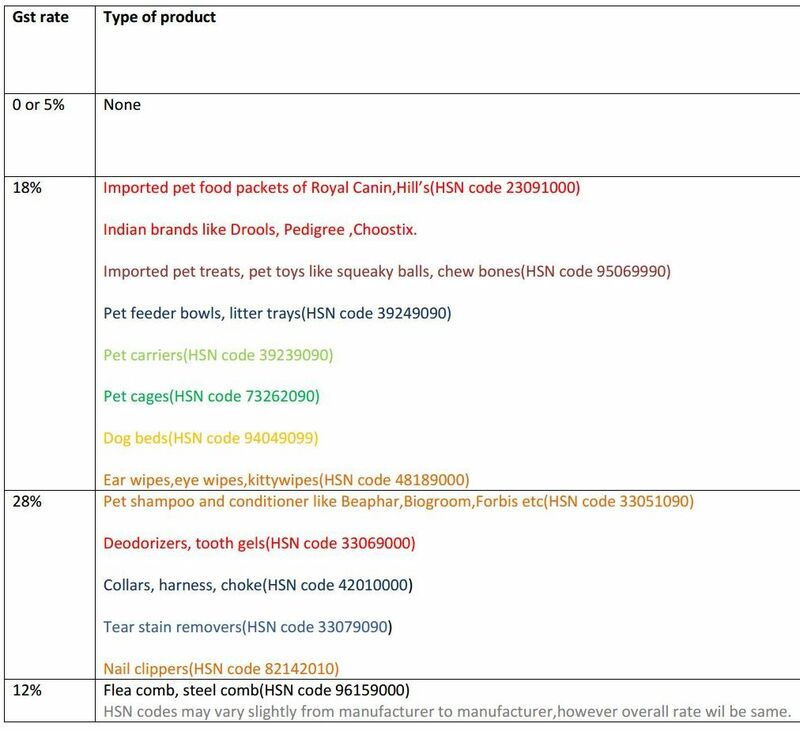 Hi,although old gst charts show 23091000 as exempted,the most recent rate is 18%.All manufacturers including Royal Canin,Hills are also charging 18% gst on pet food as of now. According to them,they have received circular notifying change. So we are selling at the same rate we are getting as input from manufacturer. (9% sgst+9% cgst). Some supplements are likely to be taxed at 0% though. Whether conducting petshows require GST Registration as casual trader? If you charge entry fees and registration fees for dogs or sponsors, obviously you will need gst registration if amount collected is more than permissible limit. Yes if you do lodging as business, you will need to register for service gst(previously service tax). ITC on pet food where pet is used as security in factory compound. Dog is purchased at company name. You can get 18% itc.